I’m Steve Perillo of Perillo Tours. 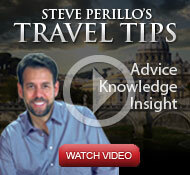 I have a video series called Steve’s Travel Tips to share all the insider Italy travel tips I have learned over a lifetime of travel to Italy. In this video, I’d love to share a video about a new Perillo Tours escorted tour of Italy: Taste of Italy!You will absolutely love these authentic corners of Italy and we can’t wait to show them to you, Perillo-style! And check out the 11-day itinerary!